So I looked up the lyrics to Gangnam style on K-Pop Lyrics and they are mental… If you’ve not seen the video then watch it above, it’s awesome! Why is Steel-Punk Not a Thing? I saw the piece above entitled Pauldrons and Arm Braces by deviant artist vofffka and wondered to my self why there wasn’t a subculture of people who dressed up like knights? The concept of chivalry and honor are quite big in some geek sub circles, George RR Martin’s Song of Ice and Fire/Game of Thrones series is hitting it off big time both in the bookstore and on the small screen and it involves wearing armour! We have Steam punk, that’s a thing that’s been a geek subculture for quite some time, arguably for some people it just involves wearing brown goth clothes and gluing on some gears, but it’s a vibrant subculture. Why don’t we have Steel Punk? Like I said I’m not talking about people wearing full suits of armor, that’s impractical unless you are LARPing or Cosplaying. 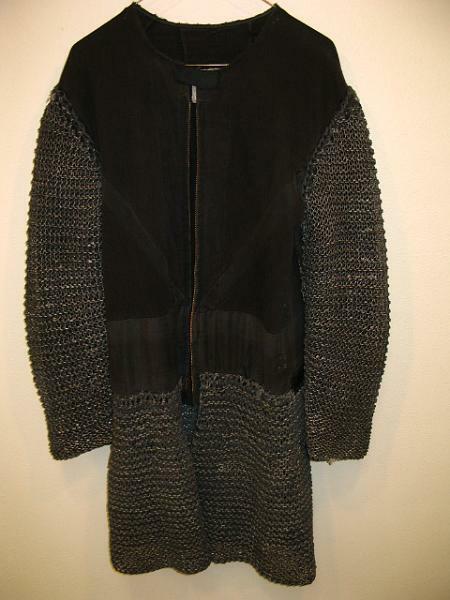 So wondering about with swords is probably out of the question because you will probably get stopped by the police pretty sharpish, but accessorizing normal clothing with pauldrons, bracers, maybe a knitted medieval helm or a knitted chain mail jumper (There is a pattern for this here)? pauldron, and vambrace entirely of hardened leather. They are all leather and maybe steel would be a little but less practical, but I still find it strange that there aren’t more people wondering about with bits of armor accentuating their outfits. Or these plate high heels by Nigel carren? He does armor fashion! All I’m saying is it seems really weird to me that despite there being a niche for this subculture and there being people who would fit into that niche the subculture doesn’t exist. Author OmarPosted on September 6, 2012 Categories Clothing/Jewelry, Costumes/Cosplay, Counter Culture, Fashion, GeekeryTags Bracers, Chain Mail, Chivalry, Cyber Goth, Cyber Punk, Day Tasks, Fire Game, Furries, Game of Thrones, George Rr Martin, Goth Clothes, Pauldrons, Quite Some Time, S Song, Song Of Ice And Fire, Steam punk, Steel Punk, Style Costumes, Subculture, Suits Of Armor, Undergrad Projects4 Comments on Why is Steel-Punk Not a Thing? I like this image of Samus exhausted after fighting the good fight by Filippo Morini. Portrait of an exhausted Samus Aranundressing from her combat armor. I think that it could have been a good front cover for the japanese version of Super Metroid for SNES.